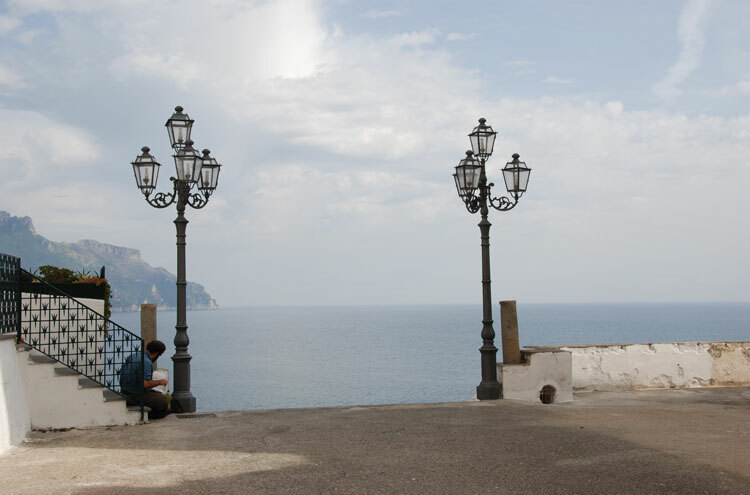 Ravello: utterly charming ancient town on a crag high above Italys glorious Amalfi coast, packed with churches, former monasteries and fine old houses, many now dilapidated but some converted into hugely atmospheric hotels. Wander through the old town, then follow old stone tracks down the hill and around the contours, through terraced olive groves under the cliffs that protected the old town. It is very hot in high summer, and very crowded at popular times. Plan your visit carefully. Delightful, quirky old Ravello on its hilltop, high above the wonderful Amalfi coast, with its ancient buildings and alleyways which often lead to a closed door with a runaway garden escaping over the adjacent wall, boasts a charming Romanesque cathedral and numerous churches, former monasteries, palaces and houses. It has long and impressive artistic links ? Wagner,Escher, Boccaccio,Virginia Woolf,Gore Vidal,André Gide, Truman Capote, Tennessee Williams and Graham Greene all had associations with the town ? and hosts a celebrated music festival in the Summer months. Though the suggested route below will take you out to some fine viewpoints back to the city itself, there is no fixed route for exploring the town: exploration and discovery are essential to its magic. 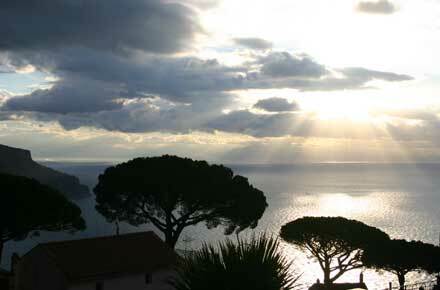 Begin at the Belvedere of the Villa Cimbrone Hotel, on a rocky ledge on the edge of the old town with its astounding views along the Amalfi coast. Wander back along old lanes and streets to the middle of town, then wind through the dilapidated outskirts, on old flagged paths, down the steep northwestern slopes. Contour around the southern hillside, through terraced olive groves, passing subsiding cottages, all under the cliffs that protected the old town. Rejoin bigger thoroughfares (steep, but wider paths) on the southeastern side, and clamber back to the old town. Find a bar with a grand view for the cooling drink and leisurely contemplation that you will richly deserve. 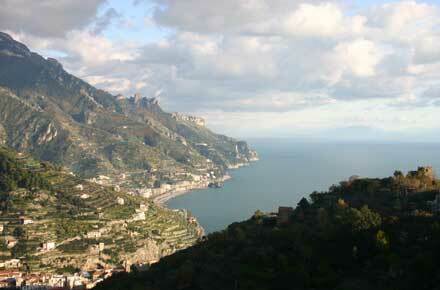 For a longer walk (2.5hr), which gives fabulous views of Ravello and the chasms that surround it, see Route(s) below. 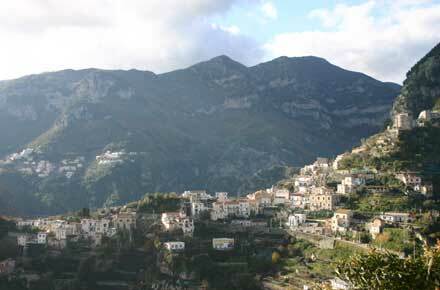 You can also walk from Ravello to Minori, and then along the coast to Atrani via the green Valley of the Mills some 10km. 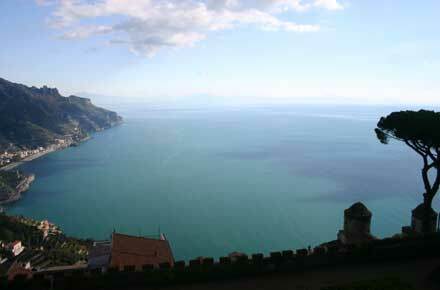 And from Ravello down to the Ponte della Ziro tower and then on to Amalfi, again around 10km. And then up to the high Valle delle Ferrire nature reserve (and then on to the Amalfi if you want). 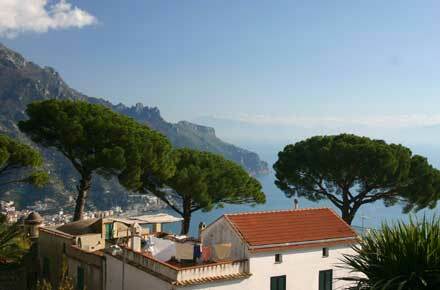 See also our Amalfi Coast page for further information.